I spent last weekend at my parents' house. Whenever my sisters or I come home, we always put in requests for dinner. When Jenny was in college and I was still a high schooler living at home, my requests didn't quite matter as much. 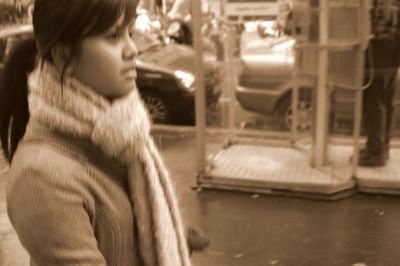 If I wanted kare-kare, I would have to wait until my sister came home the next weekend because she would likely be wanting that dish. Vegetable lumpia? Nilaga? Palabok? Wait 'til your sister comes home. It got a bit frustrating. But once I moved out, it was my turn. And I take full advantage. Because let's face it: Favorite foods just aren't the same unless they're cooked in Mom and Dad's kitchen by Mom or Dad. Last Saturday, it was chicken tinola by Dad. 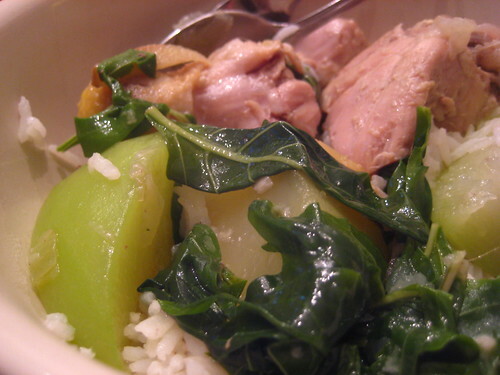 Tinola is all about the chayote and the broth. The chicken doesn't even matter to me. I even like the dish cooked with mussels instead of chicken, which is how I usually make it -- just for a change, since I eat chicken so much anyway. But seriously, I would be content with simply a bowl of chayote and tinola broth. 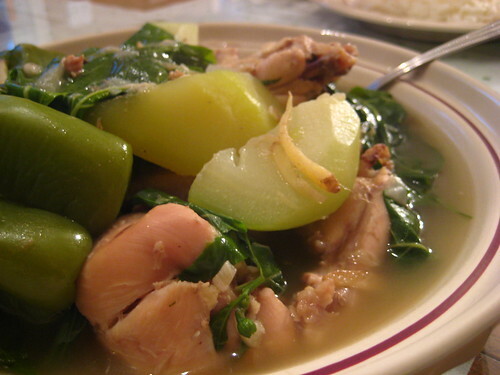 Chayote has a very mild flavor that doesn't really contribute to tinola's overall taste -- I think the loads of fresh ginger takes care of that part. It's the texture, really. Kind of like cooked apples. But not as soft. In the Philippines, my parents used papaya instead of chayote, and this time my Dad used both. I had a few bites of papaya and confidently declared chayote the better ingredient. 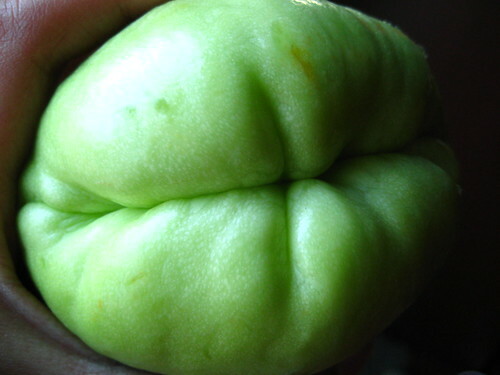 Its skin is tough and when peeled, the chayote is a slippery sucker. I always have to be careful to not peel chayote over the garbage, since the damn thing could easily slip from my hands like a bar of wet soap and tumble into the hot mess below. And after lightly gripping the chayote, it leaves a dry, sticky, filmy feel on the hands. Kind of gross. But it's worth it. Tinola just isn't tinola without the chayote. Sometimes my parents use broccoli instead, and it just doesn't compare. Dad also added green bell peppers and pepper leaves, fresh from the garden. Served over steaming rice, of course. been checking out those old lady asses lately? Sorry for ganking all the good food while I was in school! I made tinola that same weekend and it did not look like that :( Still tasty though! This has nothing to do with tinola, but check out this link http://lacer.wordpress.com/2008/07/06/the-sunday-salon-cherry-cake-and-ginger-beer/. Scroll down til she starts talking about this book Cherry Cake and Ginger Beer. It's about this recipe book that links childhood books with recipes for the food they talk about it in it! And they pull excerpts from the book in it too! How exciting--had to share! Tinola is one of my all-time favourite things. Thanks for sharing this. [eatingclub] vancouver || js - glad you enjoyed it! thanks for stopping by. Oh yum! Tinola! :) I have made this once so it still needs perfecting before posting...One of the hardest things I find about learning to cook Filipino dishes is that Mom/Dad/Grandma already make them so perfectly!!! ;) There is another tinola-like soup I made that is my grandma's favorite, from the Ilonggo region -- binakol. It adds lemongrass and uses coconut water (not milk)...it's so good!!! chichajo - i've never tried binakol...at least i don't think so. my parents wouldn't always call dishes by their filipino name when i was a kid, which is why i grew up calling kare-kare "peanut butter stuff" and leche flan "yellow cake." haha! sherry - i just sent you Marvin of Burnt Lumpia's version! sorry for the lack of recipe -- i'm just not a recipe kind of girl, i guess.